Precious metals futures advanced in this holiday-shortened trading week. 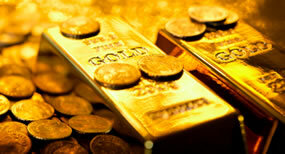 Gold posted a first weekly increase in three weeks while silver notched gains for a second week in a row. Gold for February delivery settled up $7.60, or 0.7%, to $1,075.90 an ounce on the Comex division of the New York Mercantile Exchange. Gains came as the U.S. dollar weakened. "Gold is displaying a fairly clear inverse relationship to the dollar at the moment," Bloomberg News quoted Angus Nicholson, a market analyst at IG Ltd. in Melbourne. "We may see a short-term moderation in the U.S. dollar" as the market tries to determine the timing of the next Fed rate increase, he said. Across the entire week of trading, prices climbed 1%. They lost 1% last week and fell 0.8 the week before then. Gold is up about 1% for the month so far, supported by its 2.6% rally during the first week of December. Still, the yellow metal is down 9.1% from its final 2014 settlement price of $1,184.10 an ounce. The results of Kitco’s professional survey were slightly more bullish on gold in the short term. Out of 36 market experts contacted, 14 responded, of which seven, or 50%, said they expect to see higher prices next week. At the same time, three analysts, or 21%, expect to see lower prices, and four people, or 29%, are neutral." Elsewhere, silver for March delivery tacked on 9.2 cents, or 0.6%, to settle at $14.379 an ounce. Silver prices jumped 2% on the week, their second straight weekly gain, cutting their loss on the year to 7.8%. January platinum added $16.10, or 1.9%, to $884.20 an ounce, advancing 2.7% from a week ago. Palladium for March delivery rose $6.05, or 1.1%, to $559.25 an ounce, gaining less than 0.1% on the week. Year-to-date, platinum has dropped 26.9% and palladium has plummeted 30%. Gold rose $3.65, or 0.3%, to $1,071.90 an ounce. Silver fell 13 cents, or 0.9%, to $14.20 an ounce. Platinum added $8, or 0.9%, to $874 an ounce. Palladium rose $3, or 0.5%, to $554 an ounce. Prices advanced from a week earlier by 0.9% for gold, 2.7% for silver, 2.6% for platinum and 0.2% for palladium. United States Mint bullion sales were atypically unchanged for the week, but then this year’s end of year situation is unique with sellouts called for the most popular American Gold Eagles and all silver coins. New 2016-dated bullion coins launch on Jan. 11. Below is a listing of U.S. Mint bullion products with the number of coins sold during varying periods. Products with an asterisk (*) are no longer available.